Wine enthusiasts whose interest in wine goes beyond the occasional drink inevitably find themselves weighing up their options with regards to the ideal wine cooler. 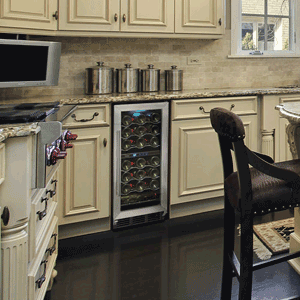 We’re now living in a wine-lovers’ world where old-style, underground or basement wine coolers are very quickly being replaced by or complemented with freestanding, countertop and built-in electric wine coolers. Consequently, certain wine cooler manufacturers seek to dominate the market or at least justify their desire for increased market share. One such manufacturer is Koldfront, which produces a range of wine coolers for every need. Check out our Koldfront Wine Cooler reviews to possibly find the perfect cooler for your specific needs. 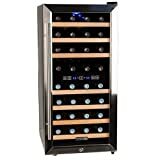 The budding or intermediate wine collector and enthusiast will definitely take a liking to this 24-bottle dual temperature zone cooler, mainly because it is built to store a good selection of your red, white and sparkling wine varieties. Thermoelectric cooling comes together with a very attractive-looking, freestanding unit to deliver quiet operation. The unit’s efficiency shines through in its temperature ranges; 54 to 66F for the top zone and 46 to 66F for the bottom zone. Wooden shelving adds a certain air of classic class to the display, while the integrated LED interior light sets the tone for a great wine experience. Setting this wine cooler up is as easy as pretty much just unpacking it and plugging it in. It will give you a solid performance while blending in with your other kitchen appliances and décor. It’s well made and also comes in some good packaging to preserve its original life expectancy. 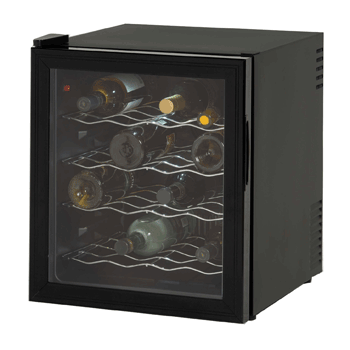 See more dual-zone wine cooler reviews. 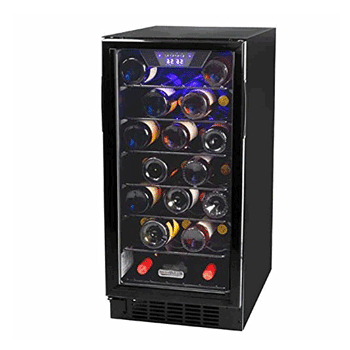 Boasting the ability to achieve a temperature range of 54 to 66F (top zone) and 46 to 66F (bottom zone), this cooler’s design parades some of the contemporary styling synonymous with the manufacturer’s 7 Series range of wine coolers. A stainless steel trimmed, tempered glass door easily complements a wide range of interior décor styles, while the two temperature zones get on with the job of chilling your reds and wines to perfection. 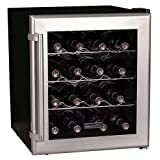 The amateur collector of both red and white wines will find this to be the perfect sized cooler which does the job of storing wines at optimum temperatures well. It has a nice firm feel to it and is made of sound materials. Read more about this model. This 16-bottle thermoelectric wine cooler from Koldfront epitomizes the manufacturer’s emphasis on producing coolers for every budget and every type of wine enthusiast. 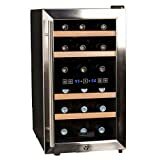 With this particular cooler, the beginner wine connoisseur will have a nice unit to complement and accentuate their interior spaces, while enjoying a temperature cooling range of between 52-64F. Witness the Peltier thermoelectric cooling effect at its best and enjoy good, silent and effective short-term storage perhaps of your red wines (given the temperature range). 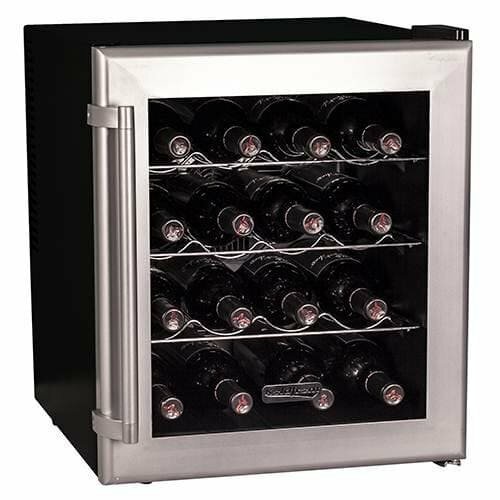 Wine enthusiasts whose appetite for wine collection is just starting to take off will particularly find great joy out of owning this wine cooler. This is true even if you don’t have all that much space available in your kitchen or anywhere else in your home where you want to put a 16-bottle capacity wine cooler. Otherwise we’d honestly proclaim this to be a wine cooler meant for short term use (not for storing vintages that mature with time or anything like that). In terms of style and design, this 32-bottle wine cooler from Koldfront maintains the standards of their 7 Series. It delivers very efficient performance while looking good. Your wine will be presented in a very sleek and elegant display, while the two cooling zones give you the flexibility of storing and chilling all your different types of red and white wines. The top cooling zone has a range of 54-66F, while the bottom cooling zone’s range spans from 46-66F. Both cooling zones are easily controlled via the centrally positioned control panel and LCD temperature display. 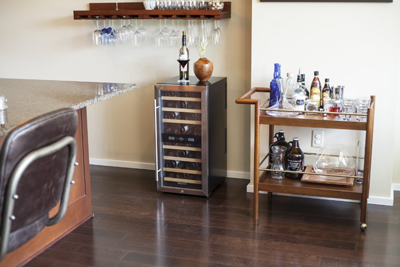 While this wine cooler would in all fairness not make any of our top features lists, it’s a perfect match for wine enthusiasts seeking a specific purpose. 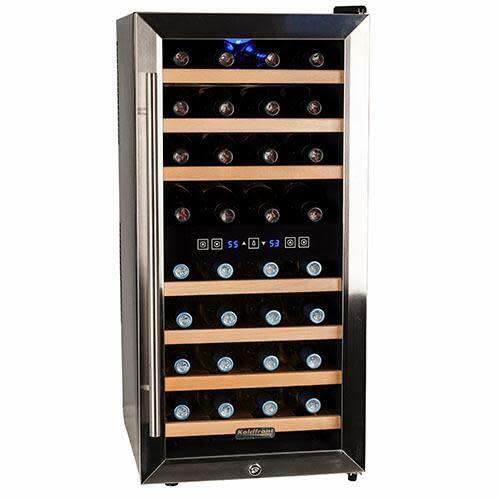 It does exactly what it says it does and works out to be good value for the money you’ll spend to keep a wide selection of your regularly consumed wines chilled and ready for decanting. Koldfront and EdgeStar, often mentioned within very close proximity to each other. The inquisitiveness of a wine enthusiast will have subsequently led you to the discovery of the fact that these two brands emerged from the same parent company, Living Direct. But what exactly are the implications of two seemingly different wine cooler brands from the same parent company? More importantly, since we’re specifically focusing on the Koldfront half of Living Direct’s wine cooler brands, what does this say of Koldfront wine coolers? The answer is diversification…But why is this good for you, especially if you have your heart set on a Koldfront cooler, largely due to some pre-identified Koldfront-specific product characteristics, like a wide functionality range and design-style range? The fundamentals of enjoying a high quality of life (as many wine enthusiasts aspire to) are centered on choice and the Koldfront range of wine coolers can be largely said to be an extension of the EdgeStar range of wine coolers. More choice in wine cooling unit models means you have more integrated features to choose from. 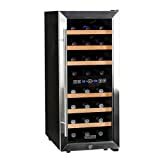 This ultimately gives you the opportunity to prospect wine coolers with the Living Direct promise of compact units that fit into every possible wine enthusiast’s lifestyle as an expected standard. Your only remaining consideration would then be on how you plan to use your wine cooler, with Koldfront coolers depicting the kind of diversity that even includes units that can be used for commercial purposes. So Why Would You Choose a Koldfront Wine Cooler Then? catering to all your wine storage and cooling needs. 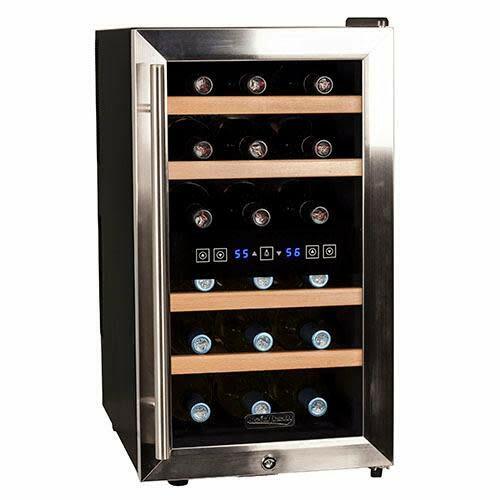 There is a Koldfront wine cooler for you, whether you’re a budding collector or indeed if you’re a regular entertainer and simply seek to have your wines on hand, chilled to the perfect temperature. Wine enthusiasts’ preferences are about as diverse as the grape varieties used to make the various wines in the world. Naturally then, you’d have your own preferences by way of how you like your wines, and certainly what types of wines you already have in your collection. If you’re an exclusive lover of red wines or if you rather prefer whites (or both), or perhaps if you even occasionally love to indulge in some sparkling wines, you wouldn’t have to look too hard to find a Koldfront wine cooler that caters to all those sets of needs; whether collectively or individually. Since maintaining the integrity of your wine is, in fact the main concern you’d likely have, Koldfront units are particularly renowned for maintaining the ideal chilling temperature set by you as the user to strictly operate within ideal wine storage temperature conditions. You can count on these units to depict negligible to very little temperature fluctuations, something which particularly shines through when the seasons transition from winter through summer, or the other way around. Generally, small and compact Koldfront wine coolers make use of thermoelectric cooling technology, which means they not only run quietly on your countertop but also save you a lot of electricity. Based on our own experience (sampled from a diverse group of wine enthusiasts) and from liaising with a number of consumers, the overall consensus on Koldfront wine coolers is a satisfactory one. Their quiet operation repeatedly comes up as a significantly pleasant feature, followed by their deliberately designed portability. As your knowledge of wine grows and your enthusiasm leads you to larger wine collection, you can always get an upgrade to a larger cooler as per your needs. However, if it’s a compact, durable, stylish and effective wine cooler you require, hopefully, our Koldfront wine cooler reviews have brought you closer to the right decision for you.